Whether you are making an aquarium, bubble tube or underwater camera housing or if you require a large diameter acrylic tube with a bonded sealed base we can find a customer to help. With years of experience behind us we can advise you on the best type and size of tube for your particular application, and any other technical help needed. 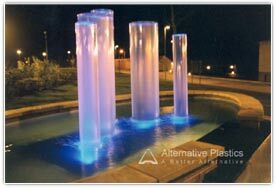 The image here shows how one of our customers constructed a beautiful fountain using large diameter cast tubes. If you require a similar fountain, or have a similar project; we will direct your enquiry through to them.